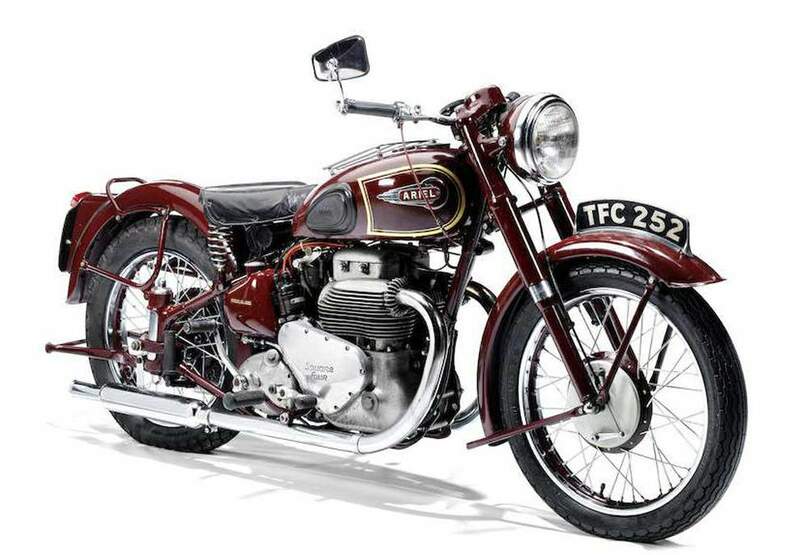 Ariel's parent company went bankrupt in 1932 when Jack Sangster bought the rights to the Ariel name and much of the tooling at a reduced cost and started a new company called Ariel Motors (J.S.) Ltd.. After the Second World War, Ariel voluntarily allowed itself to be absorbed by the BSA empire. It is an oft-told part of motor cycling folklore that London-born Edward Turner sketched out his idea for an entirely new type of four-cylinder engine (with the cylinders arranged two by two in a square) on the inside of a cigarette packet, took a train to the Midlands and hawked the scheme all around the British motor cycle industry. The people at AJS were tempted, but turned it down after second thought. Yet there was a good fairy waiting in the wings after all, in the form of Jack Sangster, chief of the Ariel factory. He gave Edward Turner his chance, and the outcome was a machine that took the 1930 London Olympic Show by storm. 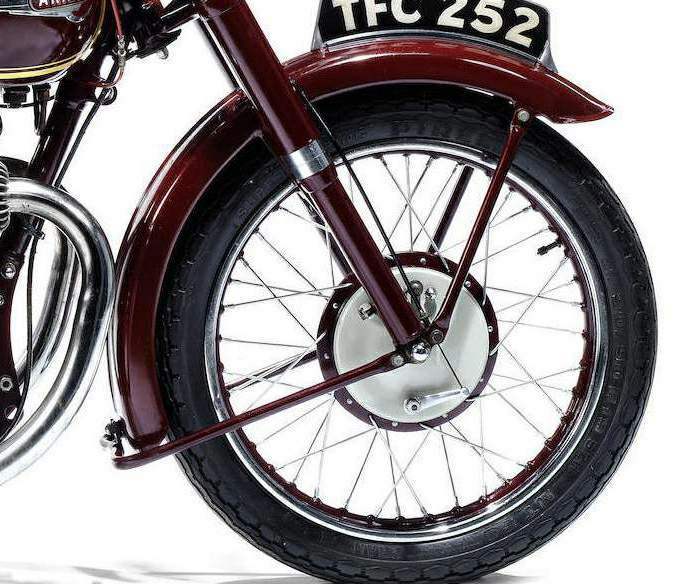 The same exhibition saw the coming of a rival four-cylinder machine, a narrow-angle mono-bloc design from London's Matchless factory, known as the Silver Hawk. Good as the Silver Hawk may have been, however, it was destined to live in the shadow of the Ariel Square Four and, after a few years, it had faded from the scene. Turner's new Square Four engine was, in effect, a pair of vertical twins (although with all four cylinders in a single casting) with their crankshafts coupled by central spur gears. Three of the crank throws were overhung, or single-sided, the fourth was a full crank, with an output shaft which provided the primary drive to the gearbox. 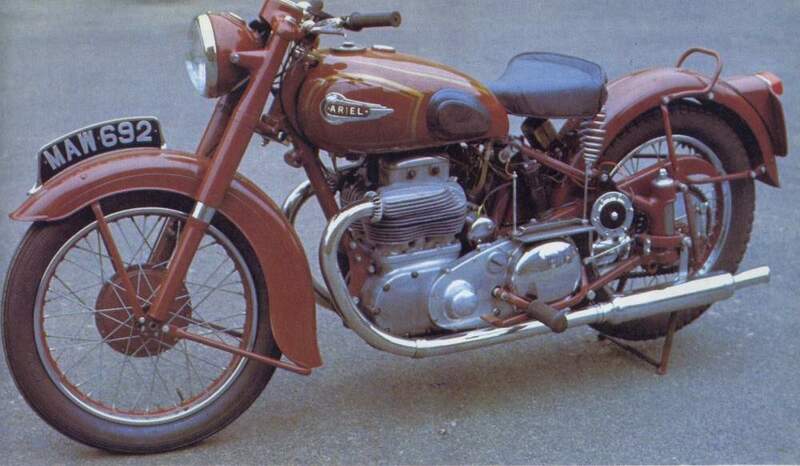 Originally Turner had planned a unit-construction engine, light enough to be fitted into the standard Ariel 250cc frame and with a horizontally split crankcase assembly. For policy reasons (the Ariel works had a contract with Burman, the gearbox manufacturer) a separate engine and gearbox were used for the production versions. 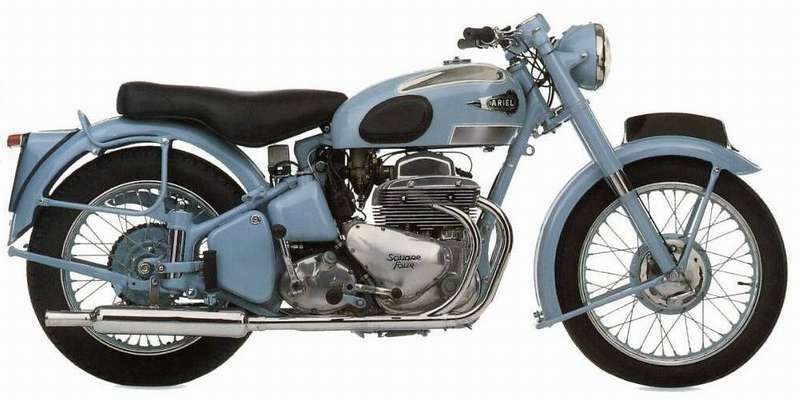 The first Square Four was a 500cc model with a single, chain-driven overhead camshaft, but before long the capacity had been raised to 600cc, the smaller model being dropped after a couple of years in production. Inevitably, the new machine attracted the attention .of those who wanted to make it go a whole lot quicker than the makers had intended, and these included Cambridge University clubman Howard Somerville Sikes, and Brooklands speed specialist Ben Bickell. Both had the idea of building supercharged 500cc Square Fours, but each for different reasons. Sikes wanted his for the 1931 Senior TT, while Bickell had the aim of covering one hundred miles in an hour. Unhappily, both men were thwarted —for the less, in the course of an endurance test for which the Ariel company gained the coveted Maude's Trophy, a 500cc Square Four did succeed, under ACU observation, in packing 700 miles into 700 minutes. weight four seemed to have become obscured, each refinement (such as the compensated-link rear suspension system) adding just a little more weight. Finally, it was decided to put the model on a slimming course, resulting in the two-pipe and—later— four-pipe all-light-alloy fours of the post-war years. 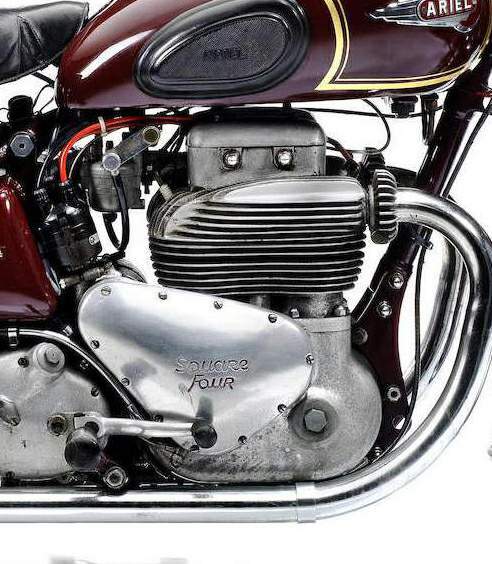 Yes, post-war, because the Ariel Square Four did not die until 1958, and in the eyes of many enthusiasts the last models were the best that were ever produced.